TVS Motors, one of the top most motorcycle brands in India, is going to launch the new step-thru moped, TVS Rockz in India by the October end. 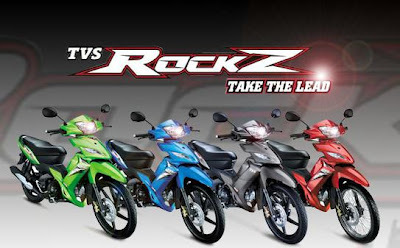 The TVS Rockz has already been launched in the Indonesia market. After getting good response from the Indonesian market, the company going to establish the new Rockz into the Indian auto market. TVS Motors hopes to get excellent response from the Indian market. The new moped will mainly target the new generation guys, who are getting interest on this kind of step-thru. The already existing model of TVS Rockz comes with 125cc displacement that is generating maximum power of 9.8 bhp. The new TVS Rockz is speculated that the new Rockz will come with advanced features like Music System (IMS), MP3 players and FM Radio. It will also be loaded with security features including Anti theft lock (ATL) and engine kill switch. The new bike will be available with amazing price tag of around Rs. 64.153 (ex-showroom,Delhi). The company is going to expand their step-thru mopeds in the country with the launches wide range of new bikes in India including. Apart from that launch, Indian bike lovers will see the new TVS Neo soon in India. However, the officially announced has not yet received from TVS Motors regarding the launch of new Neo in India. On the other hand, TVS Motors is also planning to re-launch new TVS Apache 220 and TVS Scooty streak Hybrid soon in India. Besides, another major auto market leaders are also planning to introduce new bikes in India that includes Suzuki Gladius, Vibgyor shark, Honda VTR, Ktm Duke 125, Bajaj Sonic and more.